Are you looking forward to bringing into action your business or professional plans in Greece? Are you in need of the legal advice and protection,in and out of court, that a team of experienced and proficient Lawyers can provide? Our law firm with our extensive experience and the specialized knowledge of our collaborators will provide the legal advice you require and protect your interests. A Greek general partnership is established by at least two members, with no requirements for a minimum share capital and based on an agreement signed by these partners. The members of a Greek general partnership are fully liable for the entity’s debts and can claim profits in an equal matter. Another form of partnership incorporated in Greece is the limited partnershipwhich is formed by general partners with unlimited liability and one or more silent members with his/her liability limited in extend of the contribution to the capital. Only the general members can take decisions concerning the partnership and can claim profits, while the silent partners are limited in these activities. In case of liquidation, the personal assets of the general partners can be affected by the fact that is not protected in these cases. A new simpler and more flexible corporate form, i.e. the Private Company (IKE) is introduced by Law 4072/2012. IKE is a private capital company, i.e. it is a company not subject to public listing that has capital and the liability of its members for the company debts, except for those with the guarantee contribution, is limited. It is a legal entity and considered a commercial company even if the business scope is other than trading. The first basic characteristic is that unlike the other known capital companies in Greece (EPE and AE) the minimum capital provided is one (1) Euro(whereas the minimum capital of limited liability company currently amounts to EUR 4 500). The minimum capital is a novelty at this new corporate form and follows other European states which have already regulated the formation of companies with similar minimum capital. The members however can decide on a bigger capital either when forming the company of at a later stage, by increasing the capital. In order for an EPE company to be registered for company law purposes, having as partner(s) one (or more) foreign legal entity, it usually takes one (1) to two (2) weeks from the date of conclusion of the notary deed for its Articles of Association. However, it may take at least one month for the partner/foreign legal entity to have the necessary documents required for the notary deed prepared from its country of origin. The procedure to be followed for the incorporation is summarized as follows: i) Reservation of the new company’s corporate name with the competent Chamber of Commerce. ii) Preparation of the new company’s Articles of Association and of other supporting documentation [to be issued by the country of origin of the foreign partner(s)]. Official translation of the supporting documentation from English/foreign language into Greek is also required. iii) In case a partner is a foreigner or a foreign entity or in case the management [administrator(s) or legal representative(s)] are foreigners, they should register with the Greek tax authority and acquire a Greek tax registration number. Issuance of residence permits for non-EU residents may also be necessary. 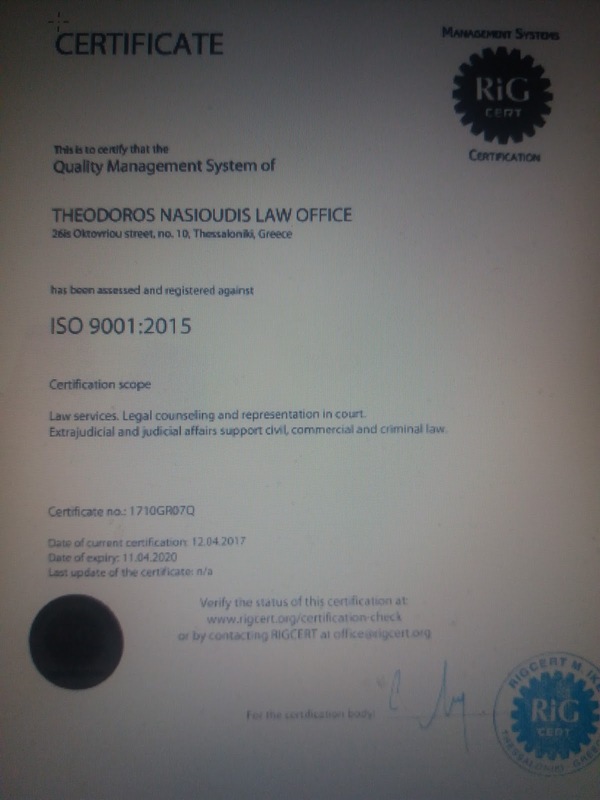 Such permits are usually a prerequisite in order for the nonEU administrators/legal representative(s) to be able to be appointed in such positions and in order for the registration of the new Company to be effected with the Greek tax authorities. iv) Conclusion of a notary deed for the new company’s Articles of Association before a Greek notary public. v) Registration of the new company with the local Court of First Instance (after having the notary deed authenticated by the local tax authorities, the Commercial Chamber and the Lawyers’ Funds) and publication of a summary of the Articles in the Government Gazette. The general recommendation costs are around 1,200-1,500 euros. This cost does not include the cost of the rent of the office and the accounting office. Some other overhead costs (eg translation) who have minimal cost depending on the volume of documents. The only documentation required is a photocopy of passport or identity card for each shareholder and some statements validated in KEP. If you do not wish you to be present at the company establishment process you can make delegated to a notary in Greece for the person who will undertake the process in Romania (lawyer or accountant). Finally in Romania the tax is uniform 16% on profits. Our office is working with accountants and Law firm Mocanu si Asociatii SPRL, which is based in Bucharest and has 16 branches in all major cities of Romania (Bucuresti, Timisoara, Iasi, Suceava, Galati, Constanta, Giurgiu, Ploiesti, Pitesti, Craiova , Rimnicu Vilcea, Sibiu, Brasov, Miercurea Ciuc, Deva, Cluj, Piatra Neamt) And can deals your company's founding process at low cost with speed and reliability above all, in any city of Romania you wish. Finally Romania is ideal for investment proposals and through our partners network we can advise you reliably to companies, real estate, green energy, etc. The Law Firm Theodoros Nasioudis-Fotini Polydorou is based in Thessaloniki, Greece, in self owned premises since 2004. Our office specialized in Criminal Law. With specialised associates undertakes representation of our clients successfully at every stage of criminal proceedings, from audiences misdemeanors up to felonies. Drafting indictments, documents explanations, replacement of temporary custody and restrictive conditions, applications for suspension etc. We have extensive experience in procedural criminal law, decisions and briefs study on issues of implementation and in terms that general preliminary proceedings before the judicial and administrative authorities.